Arrowroot is used as a thickener for sauces and glazes. It is made from a tropical rhizome (underground stem). I like using it for glazes to top fruit on a tart, pie, or cake because it has a slight sparkle and also because it starts to thicken long before the boiling point so does not cause the fruit to soften. Although cornstarch, also an effective thickener (when allowed to come to a full boil), has an indefinite shelf life if stored in an air-tight moisture-proof container, I have found arrow root to have a limited shelf life. As a result of my move from New York, I discovered I had three bottles of arrowroot each of a different vintage. I seized the opportunity to do a comparative testing of their thickening powers. The oldest one (now don't be horrified as I was!) was 24 years old! The next to oldest was 19 years old. And the third one was 14 years old. 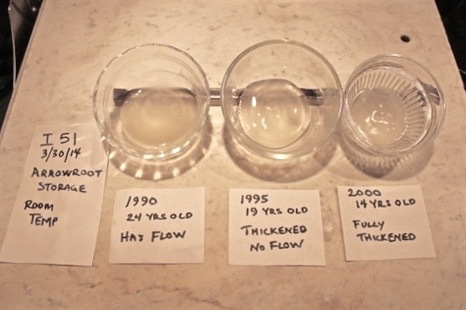 The results were: The oldest arrowroot thickened but not effectively as it still had flow. The next to oldest thickened but not as fully as the last one which also was less tinged with yellow. This was was kept in an airtight container in an air conditioned room which accounts for its unusual viability. I recommend that if you want to be sure of the full effectiveness of arrowroot, use it up to two years from the purchase date and then replace it.